Quinton Hosley of Fresno State and Riley Luettgerodt of Hawaii went after a loose ball during last night's game. FRESNO, Calif. » Something about the Hawaii basketball team seems to bring out the worst in Fresno State. It happened for the second time in three weeks last night at the SaveMart Center as the Rainbow Warriors dismantled the Bulldogs 54-42 for their first road victory of the season. An announced crowd of 11,768 watched as UH seized control late in the first half of the Western Athletic Conference contest and held Fresno State to season-low point and shooting totals. With leading scorer Matt Lojeski battling the flu and post threat Ahmet Gueye in foul trouble, point guard Matt Gibson picked up the scoring slack for the 'Bows. The junior finished with 19 points on 7-for-14 shooting and grabbed nine rebounds. But it was on the defensive end that UH (13-9 overall, 4-5 WAC) really shined. Fresno State shot 23.6 percent from the field, including 1-for-24 from 3-point range. Astonishing really, considering the Bulldogs average nearly 10 3-pointers per game. The futility began midway through the first half, when Fresno State went scoreless during the final 13 minutes and 4 seconds before halftime as UH ran off 15 consecutive points. "I felt like they were a little bit wounded," Rainbows coach Riley Wallace said. "And if we jump on them early, it's hard for them to clear their minds. "That's just the way basketball is. It's like a jealous woman. She demands all your time. If you can't give it all your concentration, you're in trouble." While not a carbon copy, last night's game bore much resemblance to UH's 83-66 victory over Fresno State on Jan. 11 at the Stan Sheriff Center. On both occasions, the Rainbows controlled the pace of the game by working the ball around methodically before finding an open shot. 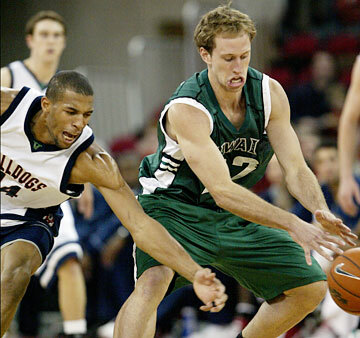 Bobby Nash of Hawaii tried to drive past Fresno State's Dominic McGuire during the first half last night. The Bulldogs tried to play a similar style but wound up with off-balance jumpers instead of good looks. Normally a transition team, Fresno State mustered only six fast-break points. "Fresno State is a very good basketball team capable of blowing anyone out on any given night," Wallace said. "But they've lost their energy." Forward P.J. Owsley added 12 points and seven rebounds for the Rainbows. Lojeski finished with just six points -- his lowest total in 14 games -- after experiencing flu-like symptoms. Dominic McGuire had a team-high 11 points and 12 rebounds for Fresno State (15-7, 4-5), which has dropped five of seven WAC games after a promising 12-2 start during nonleague play. UH, meanwhile, secured its first road victory of the season in seven tries, improving to 3-12 all-time against the Bulldogs in Fresno. "We needed a road win," Gibson said. "Before the game the coaches said we've got to start playing with some heart. It's about individuals refusing to lose." Hawaii led 27-12 at halftime after closing the period with a 15-0 scoring run. The 12 points scored by Fresno State was its lowest first-half total since at least 1989. Lojeski and Gibson fueled the surge with consecutive steals that led to uncontested layups. Gibson added a 3-pointer with the shot clock winding down. Fresno State played as if there was a lid over the basket and left the court showered by a cascade of boos. "We frustrated them," Wallace said. "They didn't get the shots they wanted. And the shots they did get, we contested them." UH squelched any hope of a Bulldogs comeback when Bobby Nash and Gibson hit 3-pointers on the first two possessions of the second half. Fresno State, meanwhile, scored just four points during a 17-minute, 7-second period spanning both halves. Late in the game, Fresno State gave Hawaii problems with a full-court press -- a big reason why the Rainbows committed 23 turnovers. But every time the Bulldogs built some momentum, Gibson or someone else would halt it with a big shot. Next up for UH is a visit to 15th-ranked Nevada tomorrow. The Wolf Pack are 20-2 overall and 8-1 in the WAC coming off Wednesday's 79-71 victory over Louisiana Tech. The game will be televised nationally on ESPN2. "A win is always momentum for another win," Gibson said. "Hopefully we can go out and put on a good show on ESPN." 3-point goals -- Hawaii 4-14 (Gibson 3-5, Nash 1-4, Waters 0-1, Lojeski 0-4), Fresno St. 1-24 (Coleman 1-5, McGuire 0-2, Hernandez 0-3, Hosley 0-4, Miller 0-10). Personal fouls -- Hawaii 24, Fresno St. 13. Steals -- Hawaii 11 (Nash 4, Gibson 3, Lojeski 2, Verwers, Gueye), Fresno St. 17 (Bell 9, McGuire 3, Hosley 3, Miller 2). Blocked shots -- Hawaii 6 (Lojeski 3, Verwers, Owsley, Gueye), Fresno St. 4 (McGuire 4). Turnovers -- Hawaii 22 (Gibson 5, Lojeski 5, Nash 3, Gueye 3, Luettgerodt 2, Verwers, Owsley, Waters, Lowenthal), Fresno St. 21 (McGuire 6, Coleman 3, Parker 3, Hosley 3, Taylor 2, Hernandez 2, Bell, Miller). Officials -- Scott Thornley, Bill Kennedy, Winton Smith. A-- 11,768.